December 28th, 2011 by Kellie B.
Ex-ASUO President and wild-land firefighter Sam Dotters-Katz has started a PAC (Political Action Committee, stupes): SHEEN, or Students for Higher Education Excellence Now. Actually, he started this back in November, but we’re just sobering up from Thanksgiving now. Though Dotters-Katz has been blogging for weeks now, today is SHEEN’s “Day of Action,” (also noted as Lariviere’s last day as UO Prez) which can be taken in two forms: Emailing or calling your representatives (no drunk dialing, D’Andrea) and the infinitely easier liking on Facebook. This is the kind of tangible political action that the Oregon Commentator values over sign-waving and extended camping trips. Show some real Duck pride by taking 5 minutes of your day to support SHEEN, and remember that every time you tell a friend Richard Lariviere gets a new hat. Would you rather be murdered or live in Beaverton? If you type “Ted Szal” into Google, you’ll find at least 4 pages of articles claiming that another “victim” of John Wayne Gacy (a serial killer from Chicago who murdered roughly 33 boys between 1972 and 1978) has been found in Beaverton (maybe more, I stopped looking). Ted Szal was never a victim of Gacy, he never eluded death, he isn’t Harry Potter and he didn’t defeat Voldemort. He probably never even crossed paths with Gacy. He’s just a guy who left home in 1977 and never called his parents to check in, which isn’t even that crazy considering they didn’t have texting in the ’70s. He apparently left parents and sisters and wife in Chicago after a routine disagreement. In The Oregonian he is quoted saying that growing up he felt like the ‘black sheep’ of his family. While his three pretty sisters were cheerleaders in school, he was more of a class clown. He wasn’t pretty, or a cheerleader, so he decided to flee Chicago for the Wild West. This isn’t very surprising to me, but his family saw this as shocking and after waiting almost 25 years, his sister Marcia called murder because he was a guy in Chicago at the same time Gacy was shoving kids into his crawl space. Marcia contacted the police department on October 18, 2011. A little slow on the draw, but whatever, it’s just her brother’s life. The police department, possibly lacking in anything better to do, decided to support the insanity by running DNA tests on the victims of Gacy, and they concluded that Szal had not been brutally murdered. They ran a background check that lead them to Beaverton, Oregon, which for some reason wasn’t their first move. I’ve never been to Chicago, but I can only assume it’s like the stone age there and they have yet to be connected to the series of tubes connecting every computer, because in The Oregonian Szal stated that with the advances of the internet, he thought his family would be able to find him, which I’m sure is true because you can find anything on the internet. On the off chance that Szal didn’t exist on the Internet, it should also been noted that he left his car at the Chicago airport before he skipped town. In his interview with The Oregonian, he stated that he threw his keys in the sewer, so nobody else could’ve driven it away, and I might be dreaming too big here, but I’m sure that checking the license plate, or doing some police-y thing could’ve brought to attention that his car was left there. That probably doesn’t matter though, murder victims always leave their cars at airports before they are raped and slain, obviously. Szal has just been living life for the last 25 years, living in various cities in Colorado and California, Springfield, and eventually Beaverton. He got re-married, has a job, and hasn’t been living under the radar in any respect. He just hasn’t called his family and they haven’t tried to call him. I don’t know who to be more disappointed in, his family for lacking any common sense or computer skills, the police for supporting them, or our parents tax dollars for supporting all of this. In related news, apparently anyone can be a police officer, so I’m joining the force. December 21st, 2011 by Kellie B. Was this an indirect result of this blog post? Yes, yes it was. We all know that a winning team is good for enrollment, but it turns out that the same success is bad for the GPA. A study conducted by three of UO’s own, Professors Glen R. Waddell and Jason M. Lindo and GTF Issac D. Swensen compared undergraduate GPAs from 1997 to 2007 to the Duck’s percentage of football wins, finding that more games won correlated with a decline in grades. This effect was found to be greater for males than females, unsurprisingly. The authors attributed this to an increase in the frequency and intensity of tailgating and general daydreaming. Beckstein was refreshingly open, stating, “it’s consistent with the culture on campus and the culture at this university where a stronger emphasis is put on athletic success than on academic success.” Case in point: the Phil Knight Center for Kids Who Can’t Read Good (And Who Want to Learn to Do Other Stuff, Too). Everyone knows that athletes learn best behind the security of a shallow moat! I say let’s vandalize George Pernsteiner’s house and personal effects until he reinstates Kim Jong Il as living human being and leader of North Korea. Oh gosh guys, I’m sorry. I kind of lost the run of myself in the last post. It’s just grief. I just don’t know what I’ll do without him. I feel so isolated, so lonely. It’s hard. Let’s just concentrate on what we can remember about him. He was a great man. I just think we should focus on that. You loved him, even if you couldn’t admit it. I met him once. I was six and he was touring the paracetamol factory where I was working at the time. They told us the night before he would be coming, so be sure to get there early and hide the wounds from our lashings. I picked my best button-down slate-gray blouse — and when I say “best,” I mean “only article of clothing,” since it would be another two months before I received my first pair of trousers — and crunched my way through that glorious paracetamol-scented morning dew. That day, they told us they wouldn’t whip us at all. It was the first day in the two years I had worked at PyongSu Cetamol that anybody went without lashings. At the time, none of us knew we’d have double the lashings to make up for it, and triple the lashings for the rest of the month. I saw my father An Doo Chol smile for the first and last time that day, the crows feet that framed his morose, ancient 28-year-old eyes narrowing, those quivering jaws parting to reveal the gray gums and those two weathered, heroic teeth. When a great man like the Dear Leader enters the room, the sensation is ecstatic. You feel it first in the hairs on the back of your neck. Mine stood up like a hundred loyal comrades and saluted the great man. Next, we all breathed deeply of the intoxicating air of sweet hibiscus and crisp dew that surrounded the Dear Leader always. That’s the nourishing breath of the Juche Idea we knew was our birthright. The paracetamol factory normally smelt like ammonia because we weren’t allowed to take bathroom breaks! My own eyes misted from the beauty of the moment, as they are misting now. I fainted with pleasure. 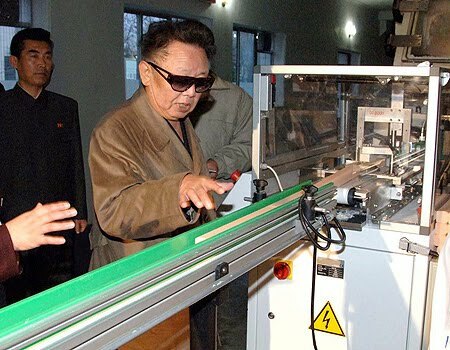 The next day, I was lashed quadruple for fainting, but those lashes felt as sweet and light as my mother Ho Sook Hye’s kisses because they were lashes of devotion to the Dear Leader. 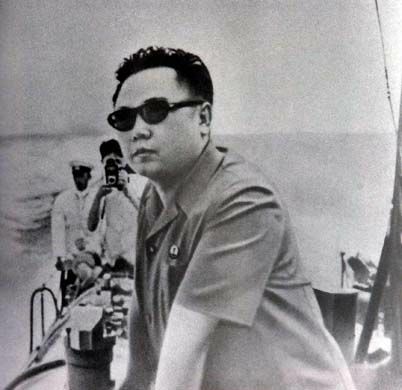 That day, Kim Jong Il pronounced ours the best paracetamol in all of North Korea. Even though the daily ration of rice gruel or carrot-green broth stopped that day and never came back, it was worth it just to hear that. You Americans. You never loved him. If you had, maybe it wouldn’t have troubled his poor heart so much. He had a big heart, but I don’t think he could take the love you withheld from him! You’ve killed the greatest man who ever was. I hope you die. OH NO! OH NO! OH NO! OH PLEASE! OH NO! nalfkjbihtyggglknj.;’/!!!!!!!!!!!!!!!!! GVBHKNJJJJJBHGVYTIULOKL;O908UIKL[PLKOMIL,;’/!!!!!!!!!!!!!!!!!!!!!!!!! OH NO!!!!!!!!!! PLOKJIU87YUHJKMLMJNH . M,KJNHVGHB.L,KKLJJGH!!!!!!!! OH NO!!!! Posted in World | Comments Off on It actually happened. Look. There he is. Alive. Like he still is. This is a lie. A LIE! It’s not real. Your Western media are feeding you lies. Tomorrow he’s going to give a speech, I’m going to photograph him ALIVE and you will all feel stupid. He’s alive. Posted in World | Comments Off on This did not happen. December 18th, 2011 by Kellie B. The “heartbeat” pattern is caused by the regular cycles of matter accumulated into the black hole from its neighbouring star. “Just as the heart rate of a mouse is faster than an elephant’s, the heartbeat signals from these black holes scales according to their masses,” said Diego Altamirano, an astrophysicist at the University of Amsterdam, who worked on the NASA project. The heartbeat was referring to the intermittent X-ray bursts as gas is sucked from stars, forming a disc around the black hole, where it’s heated by friction to millions of degrees, hot enough to emit X-rays. Astronomers have named the new discovery – IGR J1091-3624. Though it is only speculation, many experts believe that Chancellor Pernsteiner’s heart may in fact reside inside the tiny black hole. Posted in Blowing Stuff Up, Miscellaneous, Pernsteiner, Science, World | Comments Off on Science Sunday! If you weren’t already proud to live in Eugene, you certainly will be. In what can only be described as a triumph in seasonal greediness, two residents attempted to pillage a 91-year old man. Two years ago, Joseph Dinwiddie stole and crashed a 1991 Thunderbird from then 89-year old George Hinnenkamp while Hinnenkamp was on vacation. I watch the news, I’m bombarded and jaded by media, and I could dismiss that as being a pretty average and not overly ridiculous crime. Steal a car, get drunk and crash it–Saturday night. The icing on that cake, however, is that Hinnenkamp had previously hired Dinwiddie for various “odd jobs,” which I can only assume to be various adorable things old people need done for them, like painting fences or making tuna sandwiches and watching the Price is Right. Two years after this debacle (think present day) the two people (Nicole Annette Cunningham and Delano Oscar) who were in the car with Dinwiddie when he drunkenly crashed it have decided to sue Hinnenkamp for almost $200,000. They are making the claim that he allowed Dinwiddie to use his car, and therefore their injuries are his fiscal responsibility. Here’s a newsflash they must have gotten: Dinwiddie has already been prosecuted for stealing the car! He’s in jail right this very moment working off his sentence! So there you have it, ladies and gentlemen, the two greediest people to ever have existed. I understand that times are tough, prostitution and drug peddling probably don’t bring in enough income to support both of Cunningham and Oscar, but there are other moneymaking options kids! I for one am shaking my head in shame to know that we share a state with these people. I say we start a letter writing campaign to have them burned at the stake. Posted in Crime | Comments Off on Spreading some Holiday Cheer!